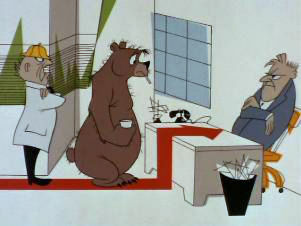 Jerry Beck at Cartoon Scoop has posted on Frank Tashlin’s 1946 children's book The Bear That Wasn’t. In case you are unfamiliar with the famous story, a bear in a forest goes into a cave to hibernate for the winter. He emerges next spring to find that a human factory has been built around him. When a foreman orders him to get to work, and he protests that he is a bear, not a man, everyone tells him, “Don’t be silly! Bears are in the zoo, not in a factory! You are just a silly man in a fur coat who needs a shave!” So he becomes a factory worker, until the next winter when he has to hibernate again. The moral was not new. It was one of President Abraham Lincoln’s favorite jokes. This has about everything except the book itself. It includes the 1947 recording of the story, read by Keenan Wynn (24’38”), and the 1967 animated cartoon directed by Chuck Jones (10’07”). Beck quotes Tashlin, one of Leon Schlesinger’s top animation directors, at length about why he never animated The Bear That Wasn’t himself, and why he hated Chuck Jones’ cartoon. Even if you are familiar with the book, don’t miss this reading, the cartoon, and the background information. And don’t miss Frank Tashlin’s other two books in this “series”, The Possum That Didn’t (1950), and The World That Isn’t (1951). The latter is not anthropomorphic, but the first two should appeal to any Furry fan.